Pesto, need I say what it means to me? Having been a lover for Italian food, I'm sure there should be no second thought that I love pesto. But strangely that wasn't how it started a few years ago when we first tasted it. Well, it was a love hate relationship that we started with. 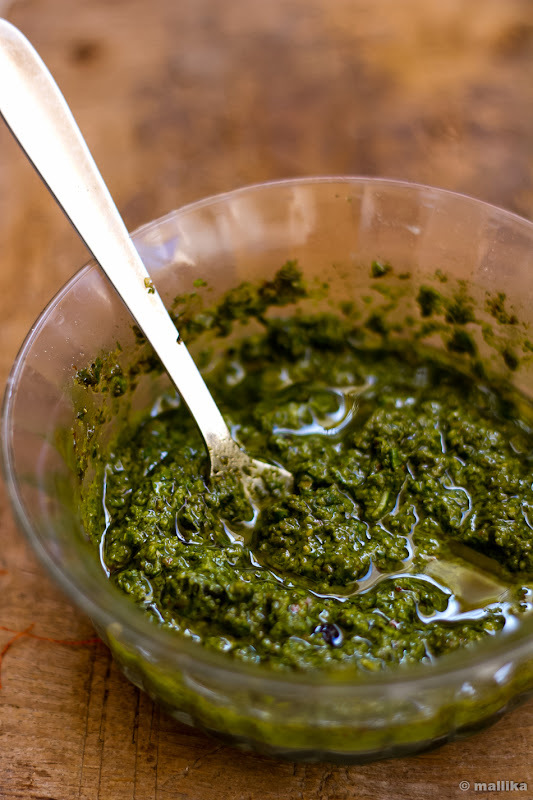 We did not really give into liking it till recently we acquired a taste for the famed pesto. 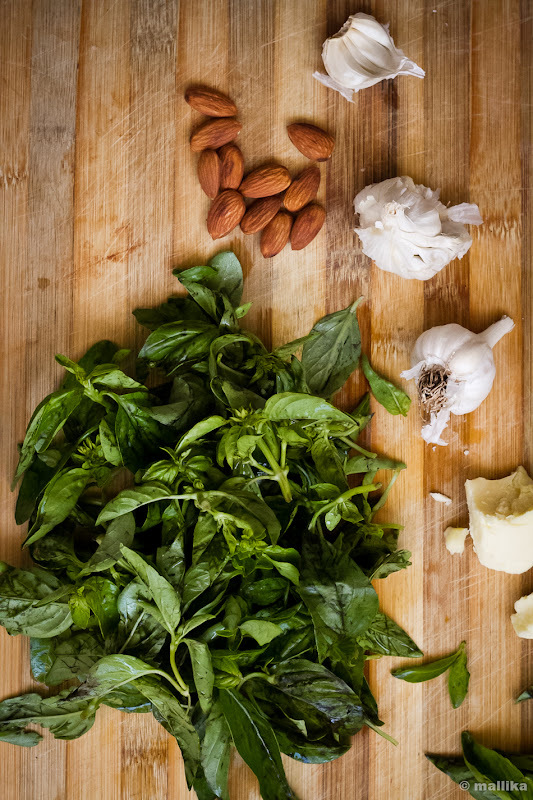 For a while we despised pesto or even the word of it. Probably, because I never made it the authentic way. My experiments with dill, coriander and other greens, except basil were not received well. I gave up for a while, feeling incredibly guilty about not tackling it and getting such a simple straight forward recipe right. So I stuck by other pasta recipes that were appealing our palate. Then recently we had it at our coveted Italian restaurant, Toscano and that's really when we took liking to it. The pesto sauce served with an assortment of breads had us a convert. It's chunky texture, mild flavour, fresh and oh-so-delicious when we smeared it on bread and even paired them with spaghetti had us love it thoroughly. 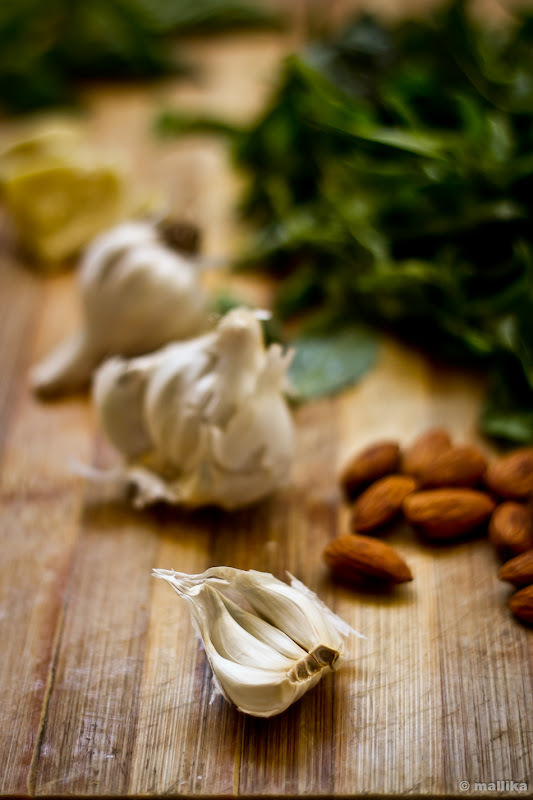 The core ingredients that make up a good pesto sauce are basil, pine nuts, garlic and olive oil. These days, getting basil in a supermarket here is not a worry, but then they are not always fresh. Hence the basil I used here are home grown in a pot, so that makes this recipe fresh and all the more appealing. Pine nuts are something I have never seen or tasted. A quick google search said walnuts or almonds make an equally good substitute. Far from fetching pine nuts here, I settled for almonds as an alternative, something that I always have a stock of. So, these were made, we relished it with simple garlic spaghetti and they tasted close to the original stuff we had the week earlier. Put all the above mentioned ingredients into a food processor and process until slightly chunky. Season liberally with salt and pepper. Pour the pesto into a jar and cover with a little extra oil, then seal and store in the fridge. It's known that the pesto will keep well in fridge for up to two weeks, although I recommend using them fresh. To make the recipe vegan, use vegan cheese or skip cheese altogether. Delicious! 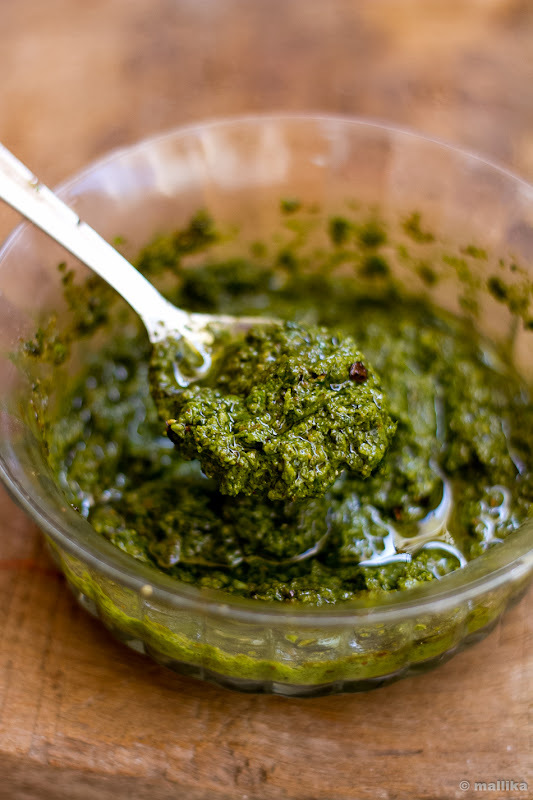 Love pesto, so good for so many things. I usually use pine nuts, the almonds are a nice touch. Love this pesto pasta and I usually make it very often or I can say this is the only pasta which we eat more often...I add either walnuts or pine nuts and very rarely almonds..
Love the look of this! Book marked :) Had a question about basil... msgd u. Looks amazing. Cant take my eyes of some of your clicks. Love to enjoy my pastas with this pesto,full of flavours.